Garlic and Sea Salt: Asparagus and Ramps...Spring has arrived! When you start to see asparagus and ramps at the market, you know spring has arrived! These two wonderful spring produce gems always find many ways to fit into my menus whenever they come into season. Although I am content to simply roast asparagus and eat it or just eat it raw if it is very tender, I like to include it in things like pizzas, pastas or in quesadillas...which was the case tonight! Ramps are wonderful as well, such intense flavor for such a little plant! I love using them in pesto, roasted the most! So when I was picking out my veggies for dinner today the asparagus and ramps were calling my name! In the pesto I decided hazelnuts, lemon juice and pecorino romano would accompany the ramps along with some basil. 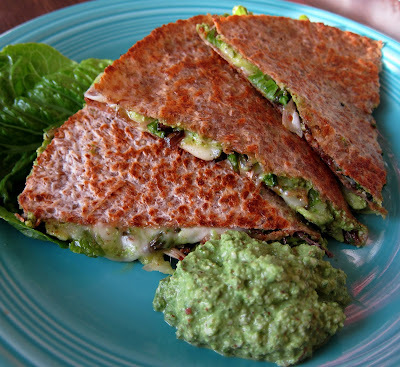 I only used the ramp tops in the pesto however, since I wanted to roast the bottoms along with some asparagus and use them in the veggie portion of the quesadillas. Since the pesto had so much flavor, I decided that mozzarella would be a good cheese for the quesadilla because it is so mild, it would showcase the robust flavor of the pesto. The quesadillas turned out wonderfully! This is a great spring meal that you should definately try out while asparagus and ramps are in season! And there will most likely be extra pesto...which is very good on other sandwiches, or in a pasta dish! Happy Spring! Preheat the oven to 475 degrees. Toss asparagus, and ramp bottoms with olive oil (just enough to lightly coat), and spread out on a foil lined baking sheet. Roast for about 10-15 minutes or until starting to brown, and soften. Remove from oven and set aside. Meanwhile, to make the pesto, in a food processor, combine ramp leaves, garlic, basil, hazelnuts, pecorino, lemon juice, olive oil, and sea salt and pepper to taste. Process until smooth, adding water one Tbsp at a time if needed to reach a smooth spreadable consistency (you may have extra after you make the quesadillas to use for something else). 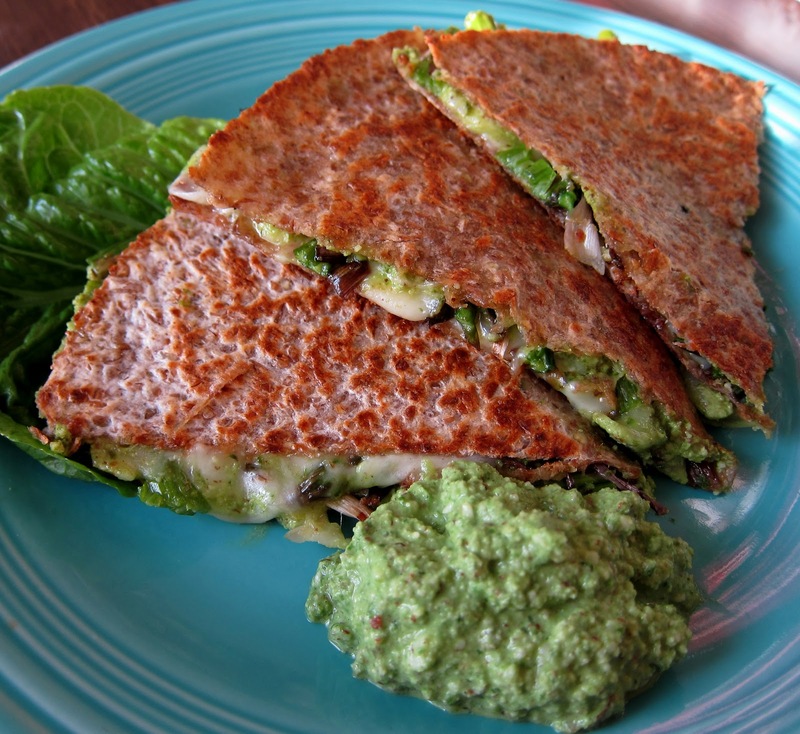 To assemble Quesadillas, Spread about 2 Tbsp pesto onto each tortilla on one side, then scatter roasted veggies over, and top with mozzarella cheese, 3/4 cup on each, then fold over. Heat a large skillet to medium heat, then coat lightly with olive oil, and place quesadillas in the pan. Cook about 3-4 minutes on the first side, until starting to brown, then flip to other side and repeat. When cheese has melted, and second side is nice and browned, remove from heat and cut into wedges. Serve with some more of the pesto if desired. Even though it's been raining here in LA, it's definitely Spring! I had some ramps served in my salad at lunch yesterday. Never heard of ramps before, now twice in one week I run across them in the blogs. Where have I been? Will definitely have to track them down and try the recipe. I haven't used ramps, I think they are related to garlic, right? I love garlic scape for pesto. Your quesadilla is perfectly browned, looks delicious.